Recently, I had the opportunity to interview one of our local race directors, Emily Schaller. Emily runs the Rock CF Rivers Half Marathon which will be their third year of this incredible race on Grosse Ile. Below is the interview with her where she tells us how the race came about and what they are doing for this year and I thought all of you would enjoy learning more about it. She's also been very busy with several other local races in the area either being the race director or serving on a race committee. Detroit Runner: What motivated you to start running as someone who grew up with Cystic Fibrosis? Emily: Running used to be one of my least favorite things to do. Why? It made me breathe hard and cough. I was always active in sports but straight running bored me. As I grew older my lung function started to decline and I was in the hospital more and more. This is common with CF patients but I didn't want to be the normal. In 2007 I decided to have a little lifestyle change. Clean eating and exercise. Three months into running and cycling my lung function grew to numbers I hadn't seen in years, I felt great and I was out of the hospital for longer periods at a time. Detroit Runner: Tell us why you started this race and your charity, The Rock CF Foundation. Emily: At a young age I began fundraising for the Cystic Fibrosis Foundation. I took it to a whole new level in 2004 when I started producing my own Rock CF concerts and selling cool merchandise to make people aware of what cystic fibrosis is. Because only 30,000 people in the US have CF we don't get a lot of press or funds for research. We are a true grass roots organization. These concerts caught on and I saw a whole new group of people that were interested in fundraising for CF. People who were normally left out of the equation. We did a few City to City bike rides (Detroit to Chicago, Washington D.C. to Pittsburgh) to raise money for CF but the thought of a half marathon for CF was on our minds for years. Holding this race on one of the coolest, community driven, and most unique places in Michigan, and where I grew up, seemed like the perfect fit. The Rock CF Rivers Half Marathon has become the staple event for Rock CF. The idea of this race is to raise funds and awareness for CF but also to get people moving! Because exercise is so good for us, all patients with CF run the race for FREE! Detroit Runner: How much has the charity raised for CF since you started it? Emily: Rock CF has raised over $100,000. In just two years the Rivers race has raised over $50,000. Personally I'm nearing the $300,000 mark. Detroit Runner: What have you learned over the last few years as a race director? Emily: Well, I never really thought I would become a race director. I have a background in stage management and love to organize events but I learned a lot in 2011 planning our first race. The average runner probably isn't aware of what it takes to put on a race, it's crazy! I've learned to have an open ear from runners, my race committee, volunteers and everyone else that makes this race a success. 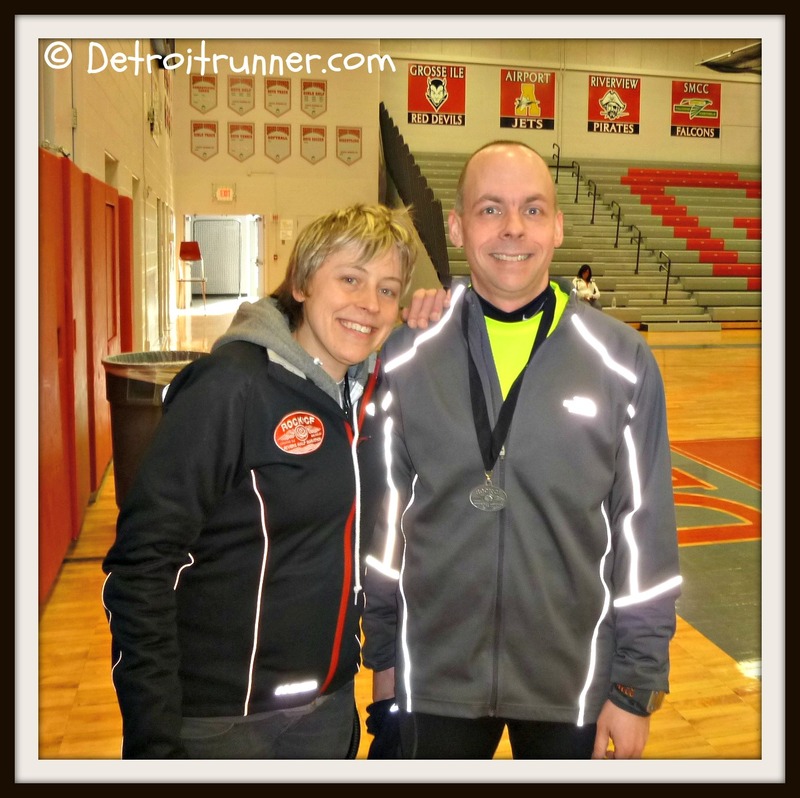 Detroit Runner: What are some of the other race distances you have personally done? I heard you just did your first half ironman. How did that go? Emily: Yep! The Beach2Battleship half iron distance triathlon on October 20. Well, I did the bike and run because I, uhhhh, don't know how to swim. A friend of mine who also has cystic fibrosis and had a double lung transplant ten years ago swam for me. He lives in the town in N.C. where the race was and has done a few Iron Man(s). Coolest race and coolest distance I have ever done. My goal is a half marathon in all 50 states. So far I have 4 states down...46 to go! ING Miami, Flying Pig, Freep, Oktoberfest in Spring Lake, Martian and Dexter to Ann Arbor. Detroit Runner: What are some pointers you would give people with CF in getting started with running? Emily: Start S-L-O-W. This is something I learned very early on. For the first few weeks I went out and tried to run fast. Bad idea. I would end up in a coughing fit every few hundred feet or so. The walk/run (very slowly) technique is the absolute best way to start. But let me remind you, when you are running go very slow. Don't get discouraged! When I started I could barely run to the corner. That taught me to just slow it way down, walk when I need, and eventually things start to click. Focus on the breath too. This distracts your mind a little but helps you gauge if you are going at a good tempo. Detroit Runner: What makes this run different from some of the other road races? Emily: The Rock CF Rivers Half Marathon, 2 Person Half Relay, 5K Run/Walk and now 1/4 mile kids run has a huge heart. We have one mission and that is to Out Run Cystic Fibrosis forever. All proceeds from this race go to the Rock CF Foundation where it is used to fulfill our mission of spreading awareness and raising funds for CF research. Again we are promoting exercise as airway clearance for CF patients by signing them all up for free. I like to say that we are a boutique style race. Great medals, hip shirts, tasty post race food and memorable group of volunteers that make this race what it is. Oh, the course is awesome too. The half marathon course traces the perimeter of Grosse Ile so runners get glimpses of Canada, the Detroit skyline and get a look at GI's beautiful homes and landscape. This year we are brining the 1/2 course through the historic Naval Air Station Hangar...it's going to be sweet! Detroit Runner: From a logistics standpoint, what are some of your biggest challenges for this race? Emily: This is a tough one. We have a great committee, great community behind us, awesome runners and incredible volunteers. Because Grosse Ile is an island south of Detroit in the river, a lot of people may not know what or where it is. Advertising and promo'ing around the state and Ohio has helped. Detroit Runner: Are there any plans to expand the race in the future to a full marathon? Emily: I get this question a lot. The half marathon is my favorite race distance. It takes a lot to put on but it's still manageable. When the last person crosses that line and we have every piece of trash picked up, I'm ready for a nap, and this usually happens by 2pm. A marathon would cut out my nap time and change to bed time...but me aside, we have to think of the residence of Grosse Ile who are so cooperative in letting us use their roads and resources for the morning. Right now a half marathon is where it's at and I plan to keep it just that. Our race is unique so I never want to get greedy or over our heads. Let's just keep this gem what it is! Detroit Runner: Is there anything else you would like to share with my readers? Emily: If you haven't already, I hope that everyone comes and checks our race out on Grosse Ile. I promise you'll like the course and when you cross that finish line you will know that you are actually helping improve the lives of patients with cystic fibrosis! Please go their website, HERE. You can also follow Emily on Twitter, HERE. LOL - yes, I look scared or something! Ha! I really enjoyed this race last year and plan to run it again. My hope is that getting ready for this race will keep me motivated during the winter. Good course, well organized, for a good cause and it is reasonably priced (which is important). The shirt and medal were good too. Followed all of them on twitter, and I'm thinking this might be a cool even to turn into a 20 miler. It's 28 days out of Bayshore though, so, not sure how that will translate.